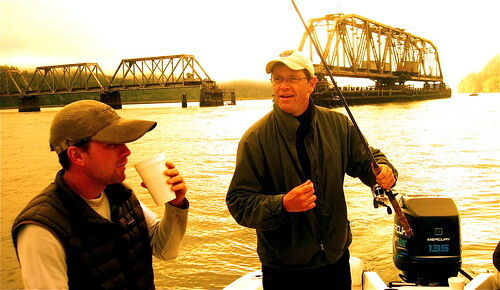 I spent three days on the Umpqua River last weekend, starting with a morning in Reedsport fishing for fall chinook. 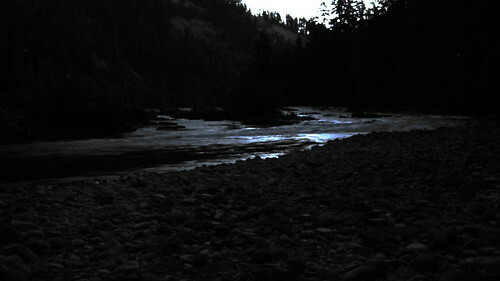 Salmon were in the river between the mouth and Dean Creek. We stumbled onto a couple good spots to fly fish this huge estuary, and trolled spinners without much luck, but a few guys landed some early season chromers. I spent the rest of the weekend on the North Umpqua with my parents, visiting from Ohio. I fished a couple mornings before dawn. Well, what the hell. I followed him to his magic steelhead hole and indeed, there were big silver steelhead darting all over… in Steamboat Creek. Oh well. Salmon and steelhead are around in the Umpqua. If you can convince them to bite, tell me how. This entry was posted in North Umpqua River Fishing Reports. Bookmark the permalink. LOL, talk about a blog post title that grabs my attention! I think the title should say “These Steelhead are Easy”. I have yet to catch one in the 6 years I have been trying. I’ve hooked into 5 steelies and lost them all fishing last year and this on the Qua. Did hand a nookie though in the camp water. First one.